Did you watch the Nats game tonight? Or maybe listen to it on the radio? Then you maybe you heard the word "Shark" a couple times...or maybe you heard it over and over and over being chanted by the entire stadium after his game tying double! The craziest part about this is...Terry and I weren't even AT THE GAME. 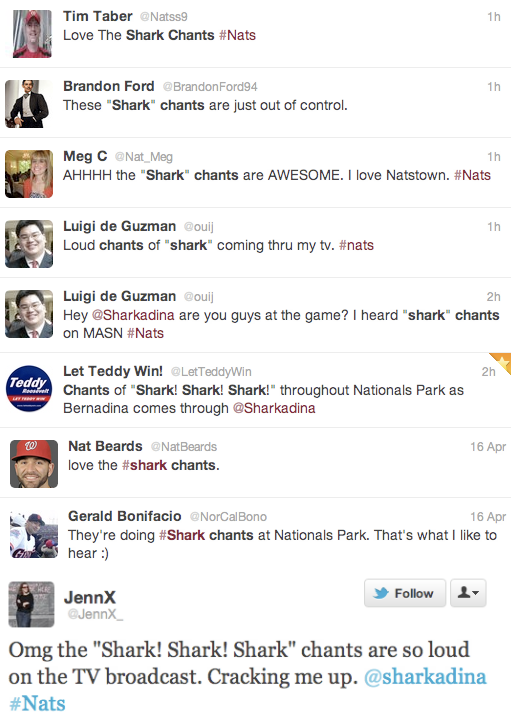 We all knew "The Shark" nickname was pretty popular before, but now it is REALLY taking off. Steve Berthaiume even used it on ESPN's Baseball Tonight (video soon). Although this is not the first time the name has been used on the show. We have some exciting news coming soon about Sharkadina so be sure to keep checking the blog for updates! Hearing the Shark chant on the mlb radio broadcast of the game was amazing, really made my day sitting here half way around the world. Look forward to the next time I'm in town and can attend a game to join in. All thanks to your fanatical hard work, Thanks!